To be inspired is to touch base with what is within. In our year long adventure of gifts in the form of abilities, talents, skills and capacities, each of them come from within. When we create opportunities to become aware of them, learn more about them and apply them to realize the levels of learning are continual learning. What we share from that process has evolved to become useful to others, and all from a seed planted within. In is a place of containment. It holds cookies in a jar as effortlessly as it holds the gifts of humanity within humans. In is an enormous place that is without measure and it is a place we go to when seeking comfort, solace or truth. This place of in is a great keeper of many things. It acts like a directional signal and a definition of where things come from. In makes more valuable the invaluable, in its addition and detracts the frequency in infrequent degree. Stepping from the border into the labyrinth, we are within. In this year of at least 365 within’s, it has show itself to be a vast and varied place of exploration, creation, acceptance and discovery to name a few of the findings that have raised a curious flow of feeling to follow. The place within has expanded and marvelously, there is always room for more. The inspiration each month came from a desire to explore honest living, and in doing so, the within will always be a reminder that we are never without. As you step into the labyrinth today, notice how many other ways you are in or within during the walk or in your life experience. Giving to ourselves as well as what we give to others is a reminder of what we do possess in gifts, capacity, ability, skills, and talent that bring us fulfillment. The first five days will focus on what has been developed in this year and what it gave. Inspiration in the inner motivation we possess, the focus of looking back at our discoveries to notice over the next five days about what inspired our capabilities into actionable realizations will be a great topic to select meaningful moments this year. Fortitude in the courage, resilience and mettle that have risen this year when in consideration of the ways we understand, use, and apply the labyrinth and relate it to ourselves either personally or professionally, the next five days will be reflective. Talent is something everyone possesses, discovering natural gifts using the labyrinth in a variety of ways reveals depth of talent to reconsider and perhaps discover something new over the following five days. Skill is learned, developed, and practiced through desire and the more we can apply it in various ways, the more we comprehend with new levels of learning. The last five days will be an opportunity to renew, remember and redesign skills. • Group Walk, Program, Workshop, Education, etc. • Designs, Artwork, illustrations, photos of labyrinth you walked, etc. • Building concepts, tips, techniques, design ideas, etc. • Writing, poetry, creations, installations, etc. 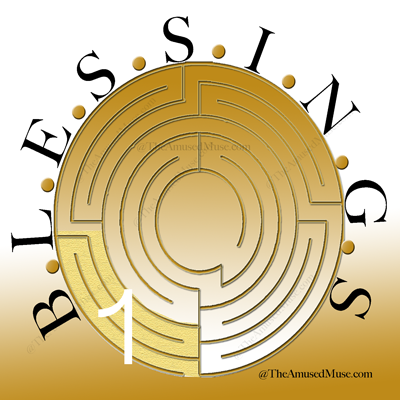 • Learn something new about yourself, others or the labyrinth this month. share your experience as part of the Labyrinth Society’s Daily Wisdom Archive. Be curious, join the conversation and share your experiences of the first two weeks in the month of thanks and appreciative gratitude. Join us on the Mid Month Dialogues to share what you have discovered in the first half of the month, ask questions and hear from others about what they explored and discovered. Be inspired with a greater appreciation of what may bring morel insight into the second half of the month with a labyrinth connection and a greater perspective in our year of living honestly. Exploring the elements of thanks, gratefulness, and appreciation may have elevated and expanded understanding of gratitude. It is understood in the cognitive sense, experientially impressed in the body, emotionally directive and soulfully affirmed. The fourth element of gratitude is found in the blessings it creates. As all experiences have beginnings and endings, blessings are found in both, yet stem from our interaction of being aware, explored or applied. Blessings are always available, though it takes our participation to realize the prize that awaits our request. One path at a time, we open blessings. This week gratitude opens from the blessings we count. In the walk of the labyrinth we begin and end and begin again. From the first step in to the turns that are frequent, there is a place we move into as we move out of one turn and into another. The same holds true for the center space of the labyrinth. We step in and we go beyond. What takes us beyond is the curious mystery of what lays between spaces, after and before. In each a blessing is tucked away in between the access and egress. Blessings are everywhere, though with a walk of the labyrinth, there is an intention to discover through movements which become a continual action of into and out of. With each navigation we chance to open what lays within and what invites us beyond. Walk the blessing of going beyond the spaces, places and races from here to there, counting the blessings that appear in your walk. In discovering the elements of gratitude, thanks is an expression we use to communicate our sense of what we hold gratitude for. 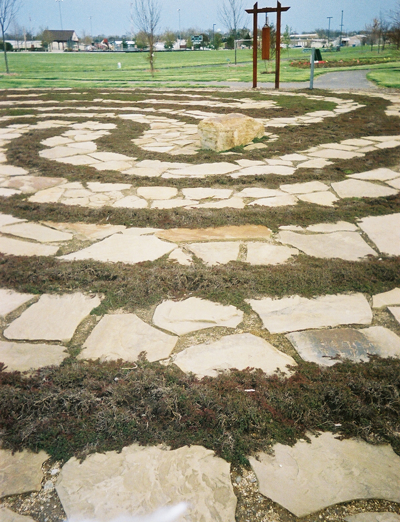 Explore the ways Appreciation is felt this week on the labyrinth in daily walks, group facilitation, program creation, offerings, artwork, illustration and design, building canvas or permanent designs, books written or poetry created. However you find thanks as the path, on the path or of the path you are on… how is it expressed? Personal: consider the ways of your own personal adventures and use. Associations: contemplate the ways of use with friends, family, and relationships or other acquaintances. Environs: realize the community uses, organizations, landscapes encountered. Global: imagine the ways that what you do reaches others in the world environs. As we close this merrier month of May in celebration with new realizations and old appreciations, we are uplifted in the capacity we have as humans to look for the path that provides the light. It is our hope this year to provide an honest way to experience the greater abilities of ourselves that can be surprisingly simple and true. In walking this path we can embrace the world changes with our changes in some new ways that help us to evolve as citizens of the world walking a path that is unique to each of us and common to all. Each day in May, as each day in 2018 a new posting has been provided with illustrations to explore, evolve and energize the subtlety of how celebration provides us a path of possibility for our walk on the labyrinth and the steps we take in our everyday occurrences. This month we’ve celebrated beginnings, festivals, World Labyrinth Day, Mother’s, birthdays and more reminding us that one day of celebration commemorates a year of effort. On this last day of May, we also celebrate those we memorialize who stood for the country and served in its defense. Today marks a great celebration of service and whether you are of this great nation or another, walking together as one nation and one world is a fitting way to close our month with great realization of great appreciations. On the first day… we walk in and on the last we walk out to a new beginning. In appreciation for this opportunity of sharing the celebrations of May! Reflect on your month’s education of celebration and how your last walk of the month reflects the appreciations of your realizations. Life is a celebration to explore in the next 31 days. With the idea of walking the labyrinth and its tri-focus on releasing, receiving and reflecting, let’s shift the perspective to one that walks in with appreciation, finds the honest realization from each day and walks out in celebration. Observe what 31 days of this focus might reflect and how it elevates our life condition. Join our Mid Month Dialogues on May 15th at 2pm CST for a lively look at what you have created and will create in the idea of celebration. 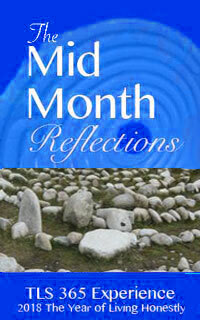 This month’s theme was a direct result of our last month’s Mid Month Dialogue! Participate in the daily opportunity of this educational focus of your personal journey, how you lead, teach or share with others, and what you create for contribution or purpose with this theme. Remember that our theme is about finding our greater capacities, abilities and true realities in being honest with our potential. We focus on what we can do as it is inherently more useful and productive. On the labyrinth the three fold path is a suggestion to release to receive and then reflect providing a wisdom of the R’s. They remind us of our busy mind and bring the labyrinth to task in providing the way for our way to prevail. Though what if we took the focus we’ve been using this month instead. Would it not elevate us from the condition of busy mind, that requires relaxing to hear our truth, to a curious mind that is ready and wants to use our truth? For something new, we might want to explore the possibility of changing our approach to explore a different kind of outcome. Just for today, let’s experiment a little with our busy minds. Lets use the trio of ideas presented this month and walk in different combinations to see what is a good fit and what brings a unique and useful outcome. As you begin your walk, use a focus of appreciation and as you do realizations can come into your experience. Celebrate the realizations of the appreciations and you might just replace any need of having to release because you’ve increased your frequency to appreciate. We are innately born to appreciate and when we apply it the world looks differently and changes our realization to one that gives cause for celebration. Experiment by walking in with celebration first and then notice your realization. It is likely that appreciation is present in the outcome. Experimenting by beginning with realization can sometimes lead us back to rationalization, and leaves both appreciation and celebration out of the equations. Explore and observe the catalyst reaction between appreciation, realization and celebration for yourself. Awareness, education and application come into the arena and are part of our year long quarterly focus. 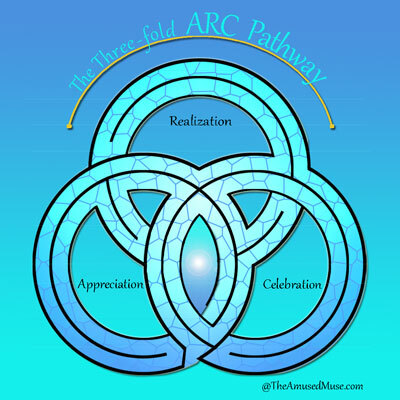 If we can find more of it with this ARC approach, perhaps greater insights await us in what we can explore in the rest of the year. Explore the walk of appreciation for realization and celebration then experience the walk of celebration for appreciation realization. Everyone starts their day differently. This morning Mom requested some cereal for breakfast and was curious about the drawings of the labyrinth that were in the next room. Bringing in a few of the designs, she finger walked the boards that the designs were on while her cereal breakfast was being prepared. She was still curious about the designs and how each were different. So as she finished her breakfast we created a little fun playing with food. We made a number of designs with the cereal, though the one she liked best was the heart shaped design. Even though she had eaten a regular sized bowl of cereal, we both munched along on the Cheerios as we designed and laughed at playing with our food. We thought if we had a tray with a lip or edge to it we could have poured milk in for the path and just grab a couple of spoons for an instant labyrinth breakfast. It was an unplanned moment of spontaneous creation and curiosity; enjoyable for both. 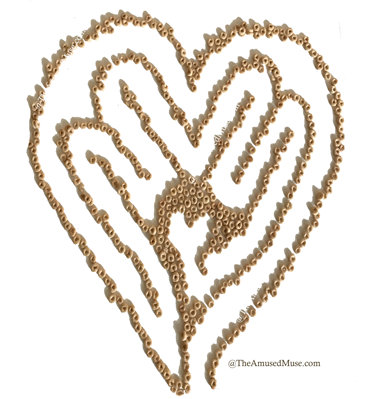 This is a new design of a heart within a heart that we created and both appreciated. As we grow in age, the time we have together is more treasured and when we can enjoy honest moments of spontaneous fun with what is at hand, they become the quality moments that remind us about what is really important and what truly matters in life. Walk on what you can put into your day that will make it worthwhile and nourishing. 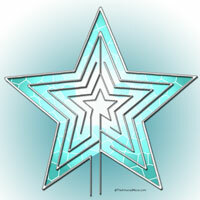 As it is the second month of the year, enjoy two opportunities… discovery and realization. This month’s 28 days will focus on how we are loving the moments we are creating. Learning to be “in love” with our focus, it expands who we are beyond the partnered relational aspects and into the focus of loving what we offer the world, who we are in community, relating at a higher level to everything and everyone; and most significantly, elevating the relationship we have with ourselves. Prepare for a wonderful experience of exercising the power of love with the freedom of honesty to realize a greater look at possibilities and potential n a delightful way. Discover how capable you are! Inspired by the variety of heart shaped labyrinths, this month capture your experiences with images of the heart. Be on the look out for where the synchronicity of the moments where your heart is in focus and then look around to see where you can find the shape of a heart in symbol. Your awareness will expand and you just might be surprised to find that when we look with an open heart, we can find it in reference near by. It does require a bit of imagination, though the findings are wonderfully worth it. Share all the heart shaped labyrinth images you find with images, links or comments and I will be happy to post the images and moments. Care to Share and Share to Care! Whether it’s a daily walk, teaching others, sharing an experience, expressions of art, building or design, we explore the questions of what brings us to honesty in our use of the labyrinth. In a world of emerging truth, the labyrinth is a great experience to discover more of what is right and true about ourselves and humanity. Join us in sharing the honest moments it reveals. The grandkids know about the labyrinth from grandma and have learned some interesting things from time to time as a result. 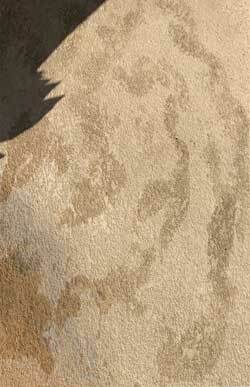 One morning in a visit with them I hopped out of the pool, the footprints from the water arched around in a semi circle and I had an idea. I kept getting my feet wet and attempted to make a double spiral labyrinth. As it was early in the morning the grandkids were not up yet, or so I thought. One by one they appeared outside ready to jump in the pool. Curious about what I was doing, they wanted to help. So I showed them what to do and soon they were racing back and forth with happy attempts to making two spirals of water footprints. A little early morning fun and a way to keep them busy so everyone could have time to rise. It didn’t photograph so well, though the intention was there and perhaps we will give it a go again later on. I happen to have come across Alice’s Curious Labyrinth online. It is set in Paris at the Disneyland location. At first I thought it a simple commercialization and then thinking differently as this month has called us to do along with our walking differently, I realized that if this indeed were a labyrinth, it might be a safe way to introduce children and their parents to the labyrinth. What I have learned in “game work”, yes I play games too, is that when children feel safe, they are more willing to take healthy risks involved in learning and become much more curious which is the gateway to learning. It may be that something we all love has been trellised up with all things Disney, though if it promotes a memory where there has been none before, why not? Virginia Tooper a pillar in Education says, “If we can get them laughing, we can slip in a little education and information”. The same would hold true when you can capture anyone’s attention and with the labyrinth, we all know there is no right or wrong way to walk it. Spirituality isn’t necessarily quiet, otherwise how do we explain song, hymn and testimony? I take risks all the time, it is where the solutions are found and possibility exists, playing it safe and doing the expected really puts us in the box that we are wanting to break free of. In the “soft eye” of the labyrinth world, this is our opportunity to think like a child in creating a labyrinth that is all about the idea of playfulness, singing, dancing and laughing. I have found a great many adults might like something like it too. 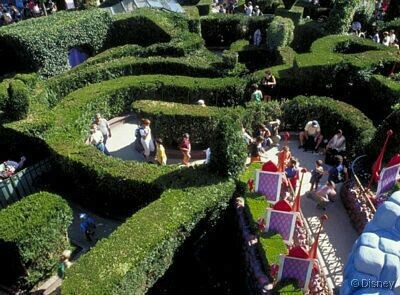 At first glance it would appear this is a maze and it has all the familiar elements of Alice in Wonderland. I can imagine that a child would have a great time running and investigating what is around each corner as I have seen children on the labyrinth play. They really don’t need all the fuss and extras, just the simple pattern to make things fun, though there are others that it makes all the difference for and creates a safer environment for. Mostly I can imagine how fun and playful it would be to construct a labyrinth with kids including their favorite things and letting them explore. I have one canvas design that I allow anyone to share thoughts and doodlings on. Soon it may be full of the words of walkers. Some of them are from children and one child who could not write, simply drew lines and squiggles, it is all relative. In the body of this labyrinth is the message of this child and in his squiggles he reminds us all about what is important. Today I shall allow the heart of the child in myself to enjoy the labyrinth (of course I do this a lot), I am sure I will have all kinds of great ideas pop up as a result, becoming childlike inspires curiosity and for me that often spells creativity. This labyrinth was designed by William Frost and his designs take the purpose in mind. I might imagine that on this particular design of the butterfly there would be a bit of whimsy and light hearted laughter joining in. As you can see it is filled with children who do what children naturally do, flit about and make a game or fun with it. I love when a labyrinth has the benefit of children as the truth they create adds a happy dimension to the walk others can enjoy later, even without any knowledge of what went on before. We have many traditional designs and in each if we look closely, there is something about everyone that has a mark of a special quality about it from the designer. Truly some are designed with a specific purpose in mind and the design may be what reflects it. I’ve been to many personal labyrinths where the designer or caretaker has added something significant that might be very noticeable and intentional and for others, a simple message tucked into the design. As our month is about moving differently, if we walked in curiosity and discovery minded about what it is that stands out in the specific labyrinth you are on today, we will have enjoyed a new way to look along with our walk of curious exploration. I find being curious, there’s not much room for the furious and the over serious. It keeps the mind and body moving and creative.